In 2013 the last time Karnataka went to polls, I was in Hyderabad with no access to Kannada newspapers. The Hindu’s Hyderabad edition which I used to read regularly did not cover the pre-election campaign extensively. Neither did the national (read English/Hindi) news channels. With the Congress government’s enormous scams coming out of the closet and Narendra Modi’s behind the scenes maneuvering to become the Prime Minister, most of the print and electronic media focused on taking sides. Karnataka, going by Rajdeep Sardesai’s ironical phrase, suffered from the “tyranny of distance”. Thus 5 years later, people outside Karnataka still struggle to pronounce S-I-D-D-A-R-A-M-A-I-A-H and Y-E-D-D-Y-U-R-A-P-P-A. 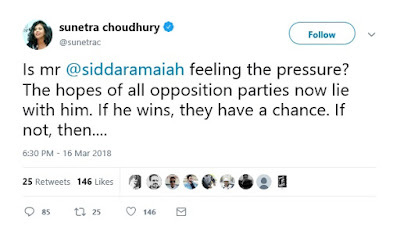 National journalists, the likes of Sunetra Choudhury are talking about the new political reality which was quite unthinkable a few years ago. A leader of a southern state holding key to an entire opposition unity and the fortunes of the Congress Party. South India up till now was only seen as a revenue stream, the easy to handle part of the political puzzle. The BIMARU states (Bihar, Madhya Pradesh, Rajasthan and Uttar Pradesh) occupied most of the political spectrum, for one being bimaru (economically sick) and two, they sent the most number of MPs to parliament. The language policy of the Indian government meant that a MP from Sitamarhi who could speak Hindi fluently had a natural upper hand than a MP from Mandya or Machilipatnam who had to give prior notices to parliament to speak in their mother tongues. The election of 2018, with a weaker BJP and a resurgent opposition mainly from southern India is being defined as a game changer. It is in the wake of this reality that Karnataka elections of 2018 gain importance on the national stage. Issues ranging from demands of a separate religion for Lingayats in Kalaburagi to the drinking water problem in Varuna are being discussed on prime time news channels of the “national media”. As a Kannadiga I am happy that the state’s issues are finally getting their due in terms of national awareness and media coverage. Up till now, you couldn’t imagine India Today sending a reporter to Kalaburagi to cover the Lingayat agitation. The things are changing with the change in headwinds in Indian politics. But the road ahead is long to correct the notion of “national” and “regional” in a media created world. Sample this, in what seems to be a black and white case of fiscal federalism and governance, Siddaramaiah’s social media post has created a storm of cacophony on the national stage. On 17th October 1990, Rajiv Gandhi dismissed the government of Veerendra Patil through Bhanu Pratap Singh who was the governor of Karnataka. A year earlier, he dismissed the government of S.R Bommai using article 356 of the Indian constitution, which later became a landmark case in the Supreme Court. Rajiv Gandhi’s mother Indira Gandhi, dismissed the hugely popular government of Devraj Urs in 1980. For the Congress Party, Karnataka which the high command refers to as “Karnatak”, has remained an easy state. The moment a leader or a rebel emerges, the high command uses all its muscle to quell him. Devraj Urs, Ramakrishna Hegde, Veerendra Patil, SR Bommai, Bangarappa, SM Krishna- all of them sidelined because they grew too big for the party. A clarion call was given to us in each of the elections – ‘swalpa adjust maadi’ and us Kannadigas buckled up and adjusted. That defined our identity to a large extent for the rest of India. The elections of 2018 are a welcome change. Chief Minister Siddaramaiah having grown up in the Janata School of politics identifies himself as a local “Halli Haida”, and has largely been successful in not becoming a Yes Man like his predecessors. Thanks to his non-congress politics for most of his life and a weakened, desperate Congress high command. He has been able to assert his power. This is good for the state. Siddaramaiah is leading the Congress’s campaign, deciding on the list of candidates to field and strategizing on the rallies to hold. Rahul Gandhi has been largely ceremonious in his presence in the election arena. This is precisely how a state election needs to be fought, with state leaders calling the shot. The BJP with an all-powerful Narendra Modi and Amit Shah will learn the lesson the hard way. Yeddyurappa has been turned into a Yes Man and has been given no real ammunition to fight the local boy Siddaramaiah. For the people of Karnataka, the cycle is all the same again. We haven’t yet come out of the “adjust maadi” stereotype. The high command of BJP, Congress cannot dictate terms to our neighboring states of Andhra Pradesh, Telangana, Kerala and Tamil Nadu. Each of those states has successfully fought against receiving their order from Delhi. When Chief Minister Siddaramaiah launched the newly designed Karnataka flag, all hell broke loose in the TV studios at 9 p.m. The panelists, some journalists unilaterally in the middle of debate termed it “anti-national”, the new buzzword in Indian politics. When Kannadigas protested against rampant Hindi imposition in all walks of life, the panelists who most often are proxies for the men in power, termed it “anti-national”. Any step to assert our federal rights was viewed with suspicion. The time has finally arrived when dedicated groups of conscious Kannada voters are demanding their fundamental right of equality. Apart from fighting for our federal rights, the onus is on us to make the rest of the country aware the federalism is not against nationalism, indeed it complements it. History has it, that rogue nations emerge from consolidation of power. The most significant change in German government after the Nazis took power was the destruction of the power of the states of Germany. While the greatest achievement of America was that the sovereign states were persuaded to allow in the constitution very limited powers to a national government and the states retained a vast amount of governmental power. The Karnataka flag, or the flag of any other Indian state is a beautiful identity of the vision of our founding fathers of the constitution and the States Reorganization Committee which took the wisest decision in keeping the sub-continent intact. The Unity in Diversity arises from our multi-culturalism and our linguistic heritage. The RSS like any other totalitarian organization believes in a Hindi and Hindu India which helps its cause to gain total foothold in the country. The politician from the Hindi heartland has had it easy till now to win elections by speaking in Hindi and believes Hindi is better for Hindustan. The IAS officer from Tamil Nadu has been taught Hindi in Mussourie and he has now come to believe Hindi is good for the Indian unity. It is time to bust the myth that federalism negates nationalism. If a student in Bhopal is given an option to learn Kannada or Tamil or Bengali, like how a student in Bagalkot is given to learn Hindi, it would lead to a stronger nation. And politicians coming to campaign to Karnataka needn’t struggle to pronounce the name of Sir M Visveshwaraiah or to utter any of Basavanna’s vachanas. It is time for the self-aware Kannadiga to Stand Up and vote for Karnataka. ಸಾಕು ಸರ್ ಇನ್ನು adjust ಮಾಡಕ್ಕೆ ಆಗಲ್ಲ!! P.S. : My last article is here: Is it time for a self aware Kannadiga to Stand Up?